When coming up with our business plan, we put a lot of thought into what would work best in our community. 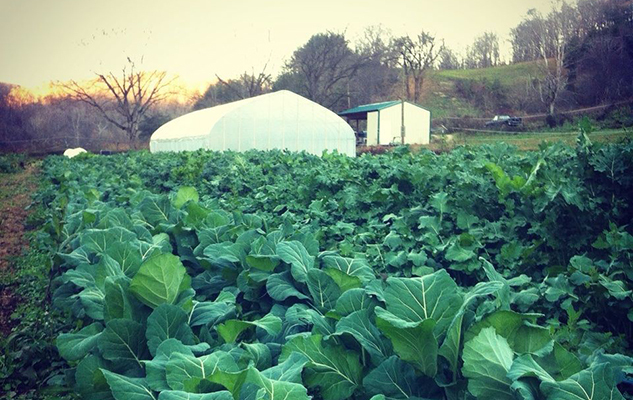 While most of the country is a decade or more into the local food movement, it is just beginning to take hold here in eastern Kentucky. Two of the most common direct-marketing strategies—farmers’ markets and CSAs—didn’t feel right for our community or our farm. When we were first making a marketing plan for our vegetable crops, there were a few small and inconsistent farmers’ markets around, but we didn’t want to depend on them for our income (although we do now sell at them some.) Will and his parents were already direct marketing meat through a modified meat CSA program, but as I created a marketing plan for vegetables, a CSA didn’t feel right either. As a beginning farmer learning to grow vegetables on a new piece of land, I didn’t want to place myself under the stress that could come from striving to maintain the abundance and consistency that a CSA requires. I also didn’t believe that I could require customers to pay a large sum of money upfront in our area. Our region is one of the poorest in the nation, and I did not want to exclude community members by asking customers to pay hundreds of dollars in one upfront sum. Although I understand the sentiment of community support and solidarity behind farmers choosing which items customers receive each week, I also wanted my customers to have a choice in the items and amounts they purchase. I thought it would be easier to convince folks to buy locally via a non-traditional method if they were able to retain their purchasing choice. After much discussion, we finally settled on a buying club model. Customers join our buying club and are then sent weekly emails with a link to the updated online farm store. Customers choose which items they’d like to buy each week, how much of each item, and then order online. After receiving the orders, we pack the produce, meat, and eggs and deliver to centrally located drop off points. The buying club model has worked well for us over the last two years, and we have started selling more meat this way. We have found the combination of vegetables, meat, eggs, and cut flowers on the online store play off one another and allow customers to purchase a wide variety of items at one time. While this system has been successful, it does not provide the influx of capital at the beginning of the year that a traditional CSA would. While we don’t plan to require upfront payment, in 2016 we are going to give our customers the option of paying an upfront sum that will be added onto a pre-paid credit card. Buying club members can then use their farm card to purchase from the online store throughout the year. Most of our farm expenses occur during the first few months of the year, so if we can convince a few of our customers to pre-pay, it would provide cash flow through the winter months as we buy seeds and supplies. Improved record keeping and planning are also part of my plan for 2016. Last year I kept detailed records that I can use in the Veggie Compass system to analyze my costs of production. After using Veggie Compass, I should have a much better idea what I need to charge to be financially sustainable for each crop. I should be able to decide if I need to be more efficient in harvesting and washing a crop, if I need to charge more for a certain item, or if certain crops simply won’t pay for the labor they require. At the end of 2014, I realized I had not kept detailed enough labor records to truly see my cost of production for each crop. 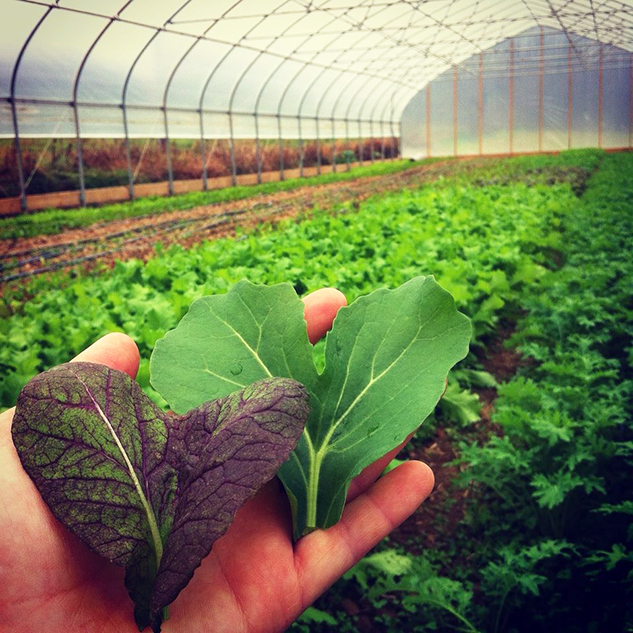 Using the records we did keep during 2014, we were able to make detailed plans for the 2015 growing season, and we planned to double our vegetable sales during 2015. Unfortunately, we only increased vegetable sales by 21%. I still think our goal was realistic, but we made a few mistakes that hurt us last year. For instance, 11% of our 2014 veggie sales came from winter squash, but we didn’t end up growing any winter squash during 2015 due to mistakes we made last spring. Costly mistakes combined with an exceptionally rainy summer meant that we weren’t able to plant as much as we had planned. Despite our disappointing veggies sales, we still managed to increase our total sales by 53% this year, including the numbers for eggs and meat. This year we will focus on being more efficient and smarter with our vegetable production to keep that part of the enterprise on par with our meat and egg sales. We know the potential for growth is there! Although we didn’t grow as much as expected this year, we are fortunate that Will has a full time off-farm job and that we are not burdened with any student loan debt. It definitely still stings that we didn’t make as much money as we’d hoped, but we aren’t going to go hungry or cold this winter, and we are thankful.